Jobu reviews the latest debacles by the New York Giants and addresses some concerns he has about stuff he’s been hearing on the radio. It’s been a couple of weeks since I last wrote about the Giants. If you recall, we used quotes from My Cousin Vinny to discuss their ugly loss to the Kansas City Chiefs. Guess what, things haven’t gotten any better in the Meadowlands. Eli continues getting worse and, although they’ve been competitive for stretches of the last two games, they still came away with two more losses, 36-21 to the Eagles and 27-21 to the bears. 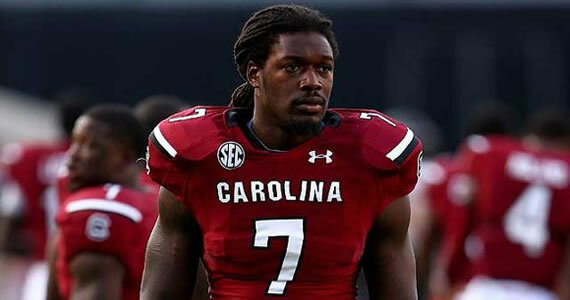 Looks like the quest for the number one pick, and maybe South Carolina Gamecocks (hee heeee) standout Jadeveon Clowney (pictured above), is fully on! I don’t really want to review the actual games because I don’t want to relive the misery. Also, I flat out did not watch the Bears game in Week 6. I was at a conference in Brooklyn most of last week, but to be honest, I probably wouldn’t have watched more than a few minutes anyway. In this post, we’re going to focus on the panic button being hit by fans all over the tri-state area, and address some things the Giants can do to salvage the future of the organization. 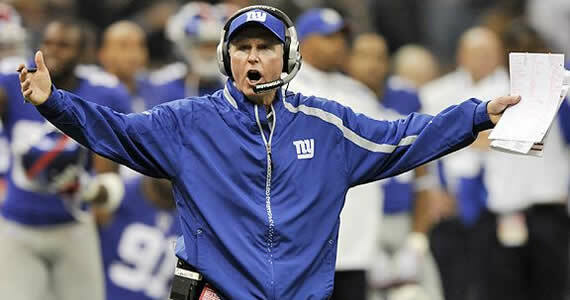 It seems everyone is calling for the head of head coach Tom Coughlin. I think the argument has less to do with wins and losses, and more to do with the fact that the Giants seem completely unmotivated to turn the season around (save a couple of guys on the team). Has Coughlin lost this team? If he has, it might be easier to change coaches than it is to change an entire team, but you’d be dumping the same coach that led you to two Super Bowl wins in the last six seasons. It’s hard to even compete for that long, let alone win twice. Just ask the Patriots? How many of the last 10 winning seasons would their fans trade for just one more Super Bowl ring? I think everyone needs to calm down about Coughlin. If you want to start looking at the other coaches on staff, that’s different. I wouldn’t necessarily fire Offensive Coordinator Kevin Gilbride. I feel like the facts that the Giants have no real offensive line or running backs, and Eli is throwing the ball to every defensive player he can find are bigger issues than the coaching strategy. That’s definitely a between the sidelines issue. Now, if you want to get rid of yourself some Defensive Coordinator Perry Fewell, maybe we can work something out. Even with the Super Bowl win two seasons ago, I’ve never been a big fan of Perry’s. I don’t think the Giants secondary has covered anyone correctly since he took over from Steve Spagnuolo after the first Super Bowl. The difference the last few years has been that the Defensive Line was constantly mugging opposing QBs. This year, those guys have really disappointed, which has exposed the horrible coverage schemes run by Fewell. He can go. I can not stress how OK I would be if he did. The other crazy thing I heard on the radio was that people are calling for the Giants to tank the rest of this season and use the number one pick to take a new franchise Quarterback. Yes, Eli is having a terrible season so far. Yes, he’s probably single-handedly cost them a win or two with bad interceptions. But guess what, it’s probably just a bad season that is spiraling out of contral as the team slips further and further down the standings. Has Eli really changed the way he runs the offense? If you’re worried about him making bad throws out of desperation, please remember the David Tyree pass. If Tyree hadn’t somehow thwarted Rodney Harrison‘s attempted armed robbery and caught the ball up against his helmet, that would have been just another bonehead throw by Eli. Eli is going to be fine, he just needs his offensive line to block people, and he needs a real life Running Back and not the pretend ones the Giants currently employ. By the way, Peyton Hillis won’t be the answer either. The Giants should probably still tank the season, but they need to use their top picks to shore up the offensive and defensive fronts or maybe find themselves a real boy to run the ball. 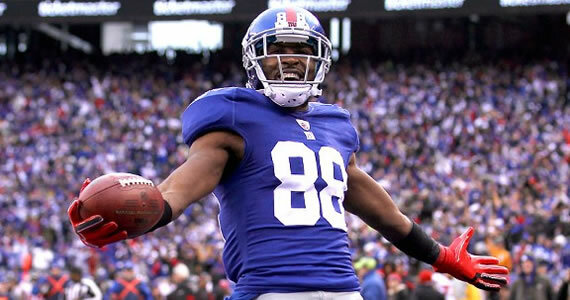 There is one move I think the Giants definitely need to make, however, and that is to trade Hakeem Nicks to the highest bidder. This team is not going to win anything of importance this year. With the emergence of Ruben Randle, they probably won’t be signing Nicks at the end of the season (at least they shouldn’t). They should trade him to a contender for whatever they can get, and then use the money they would have given him this off-season to fill another of their various needs. I like Hakeem Nicks, but he’s a bit injury prone and probably worth more as a missing playoff piece for a borderline contender than he is to an 0-6 Giants team at this point. Yes, the first six weeks of the season have been awful. There’s no way around the fact that the Giants’ season is probably over already. They actually aren’t that far behind the division leading Eagles, but, unless there’s a dramatic shift in talent or attitude, I don’t think the G-Men have what it takes to make up the deficit. It’s time to realistically look at the rest of the season and prepare for next year, when we take Clowney with the number one pick.